The beautiful upholstery of a Xenon. A custom upholstery job on an open frame gyro. A stock or custom upholstery? The choice is partly yours. Why partly? Well, a Benson type gyroplane does not have too many things to modify if you do not have a pod. You would have the ability to possibley change the seat style, seat foam, seat cover and maybe do something special with the instrument pod but that's about it. This section is therefore more in tune for those gyronauts with a cabin or pod. Before you lay any carpet or seats you may want to consider installing some lightweight soundproofing. You can get a free book from Wicks Aircraft Supply titled "Sound Proofing the Light Aircraft" by Bill Nash. This is a great little book and will show the benefits of even a small amount of soundproofing. Now lets get it all covered. Aircraft interiors really aren't much different than car interiors and many of the same materials can be used. Fabrics, vinyl, suede and leather can be used with some impressive results. I can relate to people with a passion for a nice interior. If you can have a jazzed up interior in your car or truck then why not have the same comfort and style in my kit? Why not indeed! Just as a paint job can personalize the gyroplane so can a custom upholstery job in the cabin. For those who have some aches and pains there is memory foam that can really add some comfort that you simply cannot get with standard cushion foam. This stuff was first used in the Space Shuttle and has now found applications in beds and other places where personal comfort and fit is desired. The memory foam conforms to your body shape as the foam is warmed by your body heat and is available in different densities to best meet your needs. Remember to keep the aircraft weight in mind as everything you add will increase the basic weight of the gyroplane and may reduce your useful load. Think of an aircraft cabin as an office space for flying. Are you more concerned with functionality and efficiency? 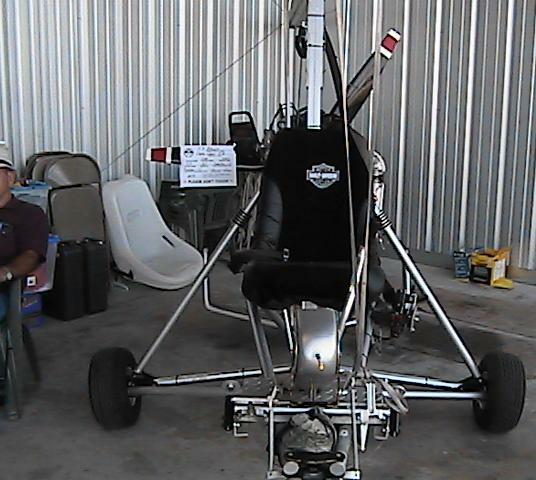 Take a look at other gyroplanes and gather some ideas and I know you can really do something special. Inside and out you will be required to have certain placards (stencils) and now is a good time to get them ordered. Stitch yourself over to Placards.